This is a new trailer for Deus Ex: Human Revolution. I find this video interesting in that it explains an event that took place in an earlier trailer – one that left us wondering why exactly a man wearing a head-phone like device would shoot himself in the head. Was he listening to a song by Taylor Swift? Or was he simply crazy? We now know the answer. Someone was controlling him like a “human proxy” – probably making him do some nefarious deed. 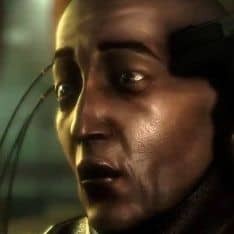 Human Proxy doesn’t show a ton in the way of new content, but I did really enjoy the flow of the video, and I definitely get a Blade Runner vibe, which is a good thing. The music – created by Michael McCann – is fantastic as always, and I look forward to writing a full review of the soundtrack when Eidos releases it. Deus Ex: Human Revolution arrives August 23rd for PC, Xbox360, and PS3.